December 5th was International Volunteer Day, which I hold rather dear to my heart. When many, many, many of us do little things to make the world a better place, change happens. To celebrate the day, I wrote a piece for Innovate Development. I hope you find it inspirational! Michael McCarthy, the Intentional Traveller and a really great guy. 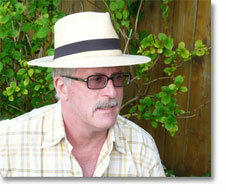 Following is a link to a podcast I did with Michael McCarthy, a writer and radio personality who lives in Vancouver. I met Michael on a trip to Louisiana and was really impressed with his travels and his efforts to make changes in the world. Where ever he goes, he contributes to communities through labour, services or goods. 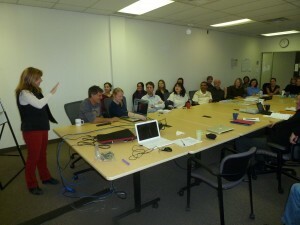 Sharing stories with volunteers and staff in Ottawa. hotel. 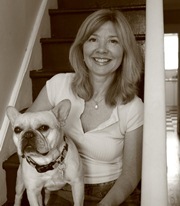 Edmonton-based Scott Portingale was hosted by his CUSO traveling partner, Ottawa writer Lisa Gregoire. Photographer Miguel Hortiguela and I drove from Toronto along picturesque Highway 7, savoring views of snow-draped evergreens against a sunny sky. At the last minute, photographer Brian Atkinson parachuted in from New Brunswick, his shooting gig having been canceled due to lack of snow. A few writers couldn’t make it. Giselle Portenier was grounded in the Dominican Republic with an injured tailbone. Annick Forest was recovering from elective surgery in Vancouver (but checked in via Skype) and Anouk Des had just started a new job in Montreal. Missing photographers included William Hirtle, who had snagged another CUSO assignment in Rwanda, and Louise Renaud, who was still in Ghana. For those of us who participated, the first day at 44 Eccles St. was all hugs and catching up. Filling our coffee mugs and digging into plates of fresh fruit, we regaled each other with tales from our adventures. Ian had faced fierce flooding in Cambodia, Anne had visited a witch camp in northern Ghana, Brian saw eggs being guarded with guns in Honduras, Lisa saw a riot almost break out as hordes lined up for a gallon of gas in Tanzania, and Miguel cycled the world’s most dangerous road in Bolivia. Our sessions included a “show-and-tell” using an item we had picked up or a photo. I brought a silver Ethiopian cross and explained how deeply Christianity was rooted in this ancient country. Anne brought a rubber stamp she had had made in Ghana for her husband. His name was prominent, while the word “poet” was tiny – a correction she requested after noting it was missing. We also shared what we had learned. The word patience came up a lot. Scott talked about “buck fever,” a frozen feeling that comes over hunters when the prey looks at them. He felt the same paralysis when shooting pictures of vulnerable people. Brian spoke of the underlying fear and sadness he had seen in people’s eyes in Honduras, “murder capital of Latin America.” Ethan spoke of anxiety people in Ethiopia felt about offending those in power. Our trips were exhilarating, eye-opening, upsetting and life-changing. We captured as much as we could in stories and photos which CUSO will use for internal and external communications throughout the year. Hopefully some will appear in exhibits and possibly a book. Prior to starting our journeys, Giselle and her husband had announced they would sponsor a photo contest, the prize being a bottle of champagne and $500 towards the winner’s favorite charity. Each team sent in a shot from their travels and a panel of CUSO staff judged them. Lisa and Scott, and Ethan and I were tied for the prize. A CUSO staffer came to the rescue with a second prize, two beautiful, hand-made stained glass picture frames. We drew straws and Ethan and I got the frames. I can’t wait to use it for our winning shot, a photo of Ethan and I in our CUSO t-shirts, standing over the rock-hewn cross at Lalibela. 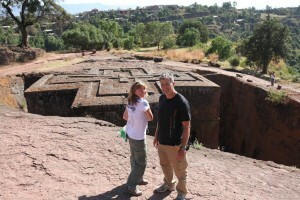 Our winning shot—the amazing rock-hewn cross of Lalibela. The last night we all went out for dinner at a pub near our hotel. Sean Kelly, CUSO communications director, regaled us with stories of his volunteer days when he drank and ate questionable substances and recorded it all for posterity. None of us did anything so foolish on our trips…or did we? Maybe at a 10-year-reunion we will reveal all. As our reflections, photos and stories are gradually unrolled this year in CUSO’s marketing campaigns, newsletters and donor appeals, I hope they garner more sponsors and recruits. It really is a fantastic organization and one I would work with again in a heartbeat. 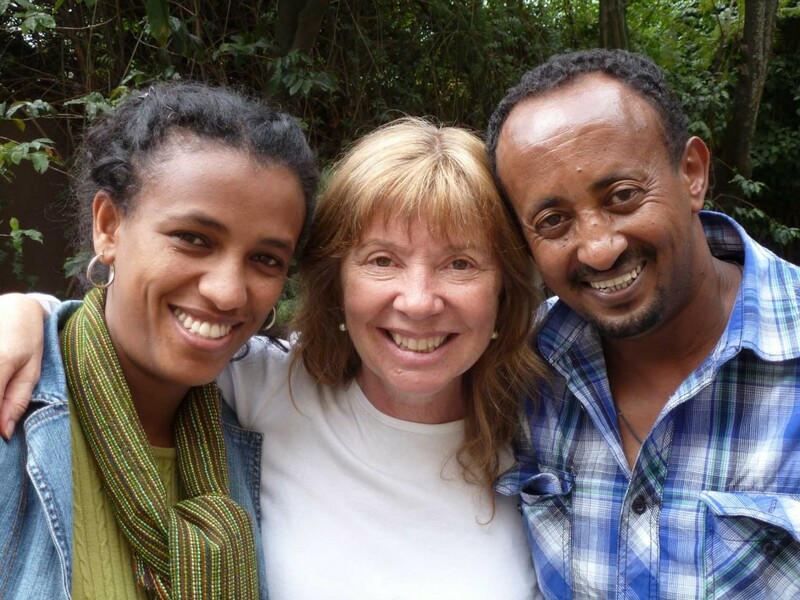 Mahlet (L) and Tamrat (R), two VSO "miracle workers." • Waking up to the bleating of sheep outside my hotel window in downtown Addis. • The sweet smell of frankincense that comes from traditional “bunna” cafes – Ethiopian coffee houses where beans are roasted, coffee is brewed and then served with popcorn. The coffee is always accompanied by a charcoal burner topped with fragrant incense. Heavenly! • Steaming double macchiato made with rich Ethiopian coffee beans and perfectly foamed milk. Starbucks can’t come close. Especially at 12 birr a cup (under a dollar). The great thing is that these delicious cuppas are available everywhere, from tiny roadside cafes to posh hotels and the quality is superb! • Berberé spice – a red chili spice concoction used in just about every dish. I love it with eggs. • Special foul for breakfast, a sort of huevos rancheros, Ethiopian-style. • Clocks that run 6 hours ahead, Ethiopian time. • Cool Ambo mineral water. Love the tree of life logo. • 1 birr coins that look like toonies and are reportedly made in Canada. • Stumbling along with a few Amharic words and having people understand me. • A climate that goes from the hottest on earth (the Danakil Depression gets to around 50 degrees C) to very chilly (in Dessie we were wearing parkas). 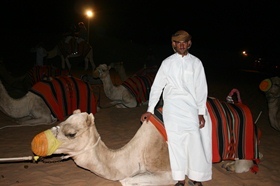 • Animals everywhere…donkeys, camels, cattle, goats. They own the road, especially in rural areas. Most of all, I’m going to miss the people. The staff at the VSO Ethiopia office was kind, considerate and extremely helpful on this assignment. Logistics ran smoothly and I felt truly taken care of. In particular, Mahlet Mebrate and Tamrat Mulugeta made my road trips journeys of a lifetime (the first to the southeast was 2292 km. To the north was 2173 km). Tamrat’s name means “full of miracles” and that was particularly true when he got us safely to Lalibela after driving 300 km on gravel roads, up and down mountains with no guard rails – and the last 40 km in the dark! Spending time with volunteers, seeing the astounding historical sights, and gaining an appreciation for the geographical wonders of this ancient land was an absolute joy. 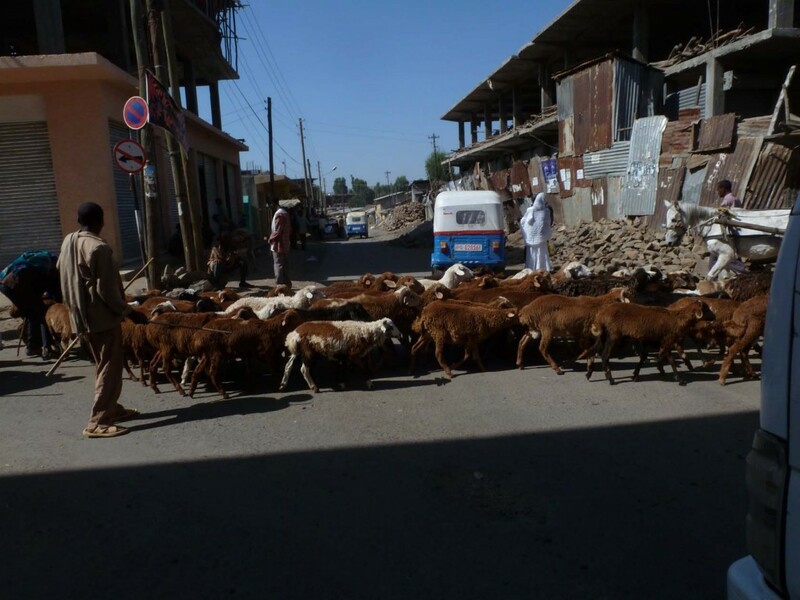 Like anywhere, Ethiopia has its problems. That’s why so much development work is being done here. But it is also a country that is emerging and determined to cure its ills. I know things are going to change very quickly. Even in my time here, I’ve seen sparkling high-rise buildings sprout up overnight, experienced excellent roads and seen mobile technology embraced by farmers and bankers alike. I’m just hoping that in the future when I return, I’ll still be able to recognize the Ethiopia I’ve come to love. 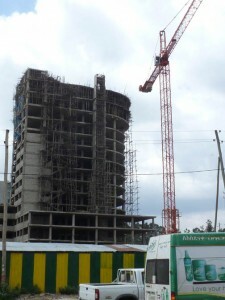 Construction like this is going on all over Ethiopia -- mostly hotels, government buildings and shopping centres. 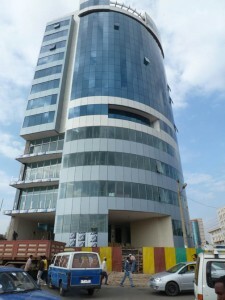 This building was finished in the time I was here. Our tireless driver Tamrat gave us wonderful insight into Ethiopian culture. 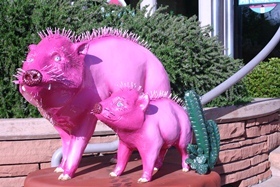 I'll scratch your back, you scratch mine! 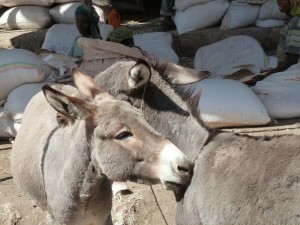 The final day of our trip was spent driving the six hours back to Addis. Goats, sheep and donkeys shared the road. Streams of people clad in white traditional garb headed to church. Others carrying bundles of firewood on their backs, or produce on their heads, filed to local markets. Car ownership is not common and the majority of people walk. It’s a slower, more determined pace of life in the rural areas. Addis is fun, with all its choices of restaurants and “ferengie” food options, but I’ll miss the clear air and rolling vistas of Ethiopia’s northern regions. I’m astounded to say we clocked more than 4,000 km on our road trips to the east, south and north! 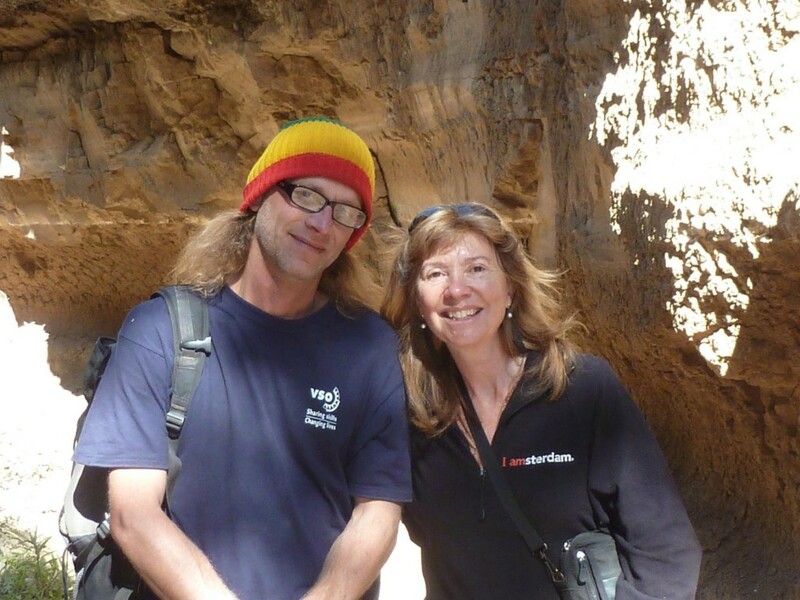 The last volunteers we visited were Daniel Shane and Nina James at Debre Markos University. Daniel, a 37-year-old IT specialist had just wired a computer lab in the girl’s dorm and proudly showed us the room where 20 young women were hovering over Internet-linked desktop computers. “The girls had difficulty doing homework at night. They didn’t want to go to the library and even when they did it was difficult to get access to the computers there since male students always claimed them first.” Eskedan Temesgen, vice president of the university girls club, agreed. 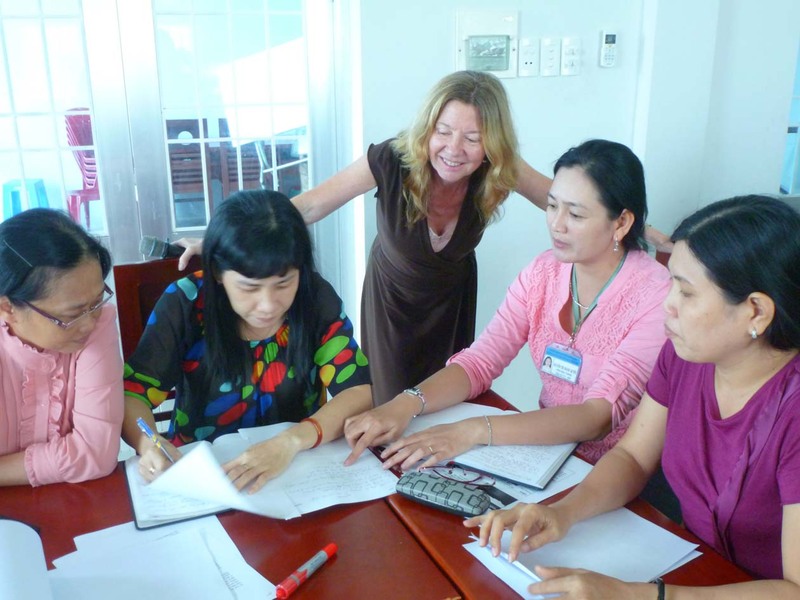 “We wanted to give women access to the Internet and provide them with the best opportunity we could. This is safer, no trouble with boys. We can use the computers at night, and any time we want,” she explained. 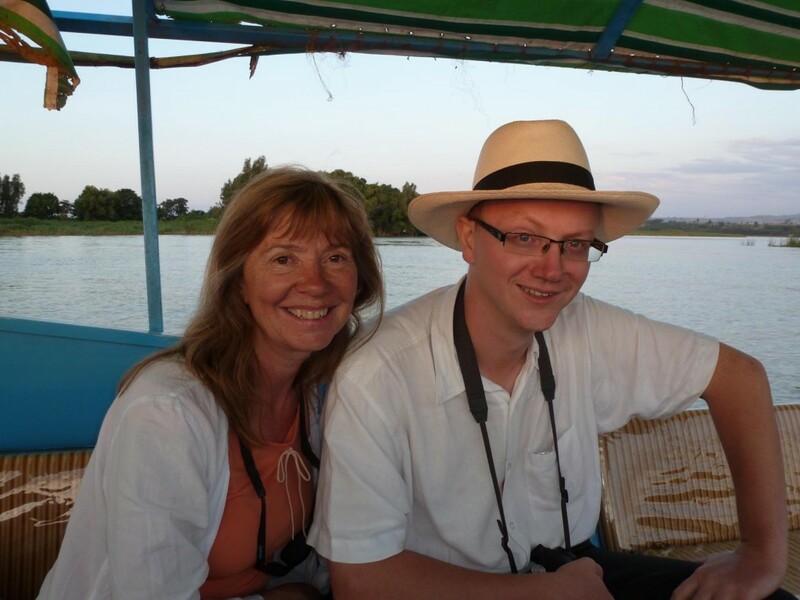 Maureen and Dr. Ed Haworth: Enjoying the sunset at the mouth of the Blue Nile. Sharing a smile with Dr. Ruth Lawley on our excursion. 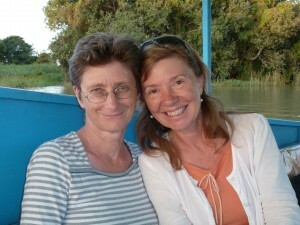 After their day’s work was complete, Ruth and Ed agreed to take a boat ride to the mouth of the Blue Nile with us. We arranged for a boat to pick us up near our hotel and motored out onto Lake Tana. Fishermen in papyrus boats glided by silently. We reached a protected inlet where the Nile’s waters begin and sat in the quiet. Two crested cranes did a bobbing dance on the land and we watched, transfixed. As we headed back, the sunset turned the water a fiery red. Taking a deep breath, I could almost feel eons of time captured in the lake’s quiet calm. 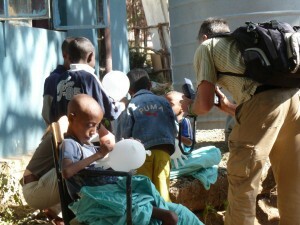 Children play with balloons as Ethan captures the fun. Debre Tabor was next on our itinerary. Angela Williams, a British education volunteer with VSO, took us on an excursion through the local market where I did a lot of smiling and pointing at vegetables and laughing with the local women. We spent that night in the historic city of Gondor, which is famous for its palace castles, built in the 15th century. 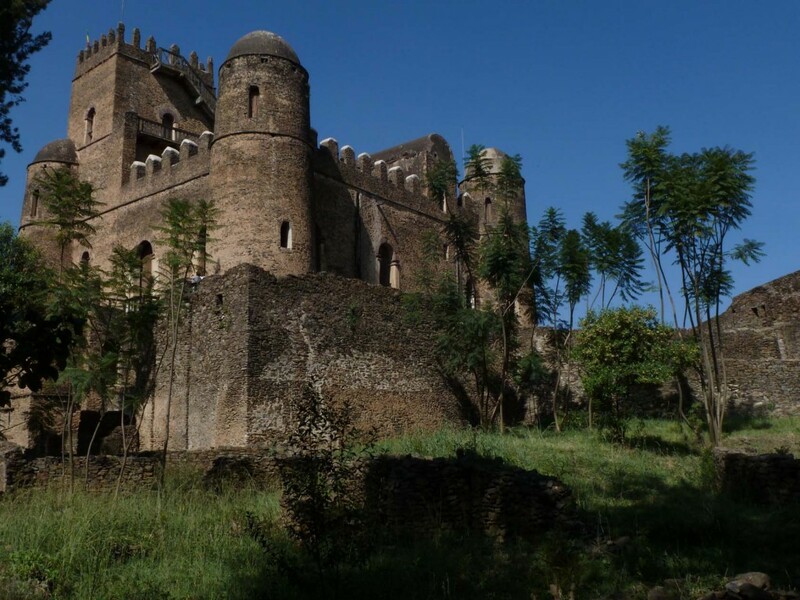 The next day was Sunday and during our photo shoot at the palace with Judy Price, a VSO education volunteer who had recently relocated there from a prior placement in Debre Behar, and Fonda Ruiter, a volunteer physiotherapist, we had to compete with about five wedding parties. One was a traditional Ethiopian celebration with loud singing, dancing and women wearing beautiful woven dresses. Another highlight in Gondor was going to the pediatric ward at the university hospital where Fonda worked. The 31-year-old physiotherapist bounced between beds, inflating surgical gloves like balloons and blowing bubbles with the children. Even though it was a chronic ward and the kids were suffering from ailments such as burns and TB, the room was filled with smiles when she left. “My job is to make children happy. It’s simple,” she explained. 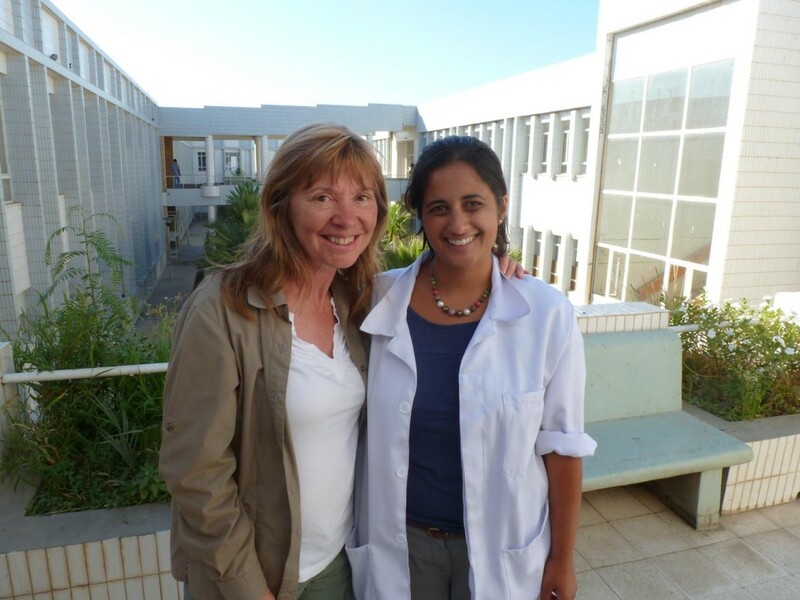 Maureen and Dr. Sarah Philip at the sparkling new hospital in Mekelle. Mike and I starting out on our hike behind the college. More driving….got to Maychew (My-Chow), a small town, around 5 pm. Checked into a large white hotel, about 4 stories high. Brand new. Two desk clerks that looked around 15 checked us in, with much scrutiny of our VSO identification cards. The rooms were Spartan, with tile floors, double bed and a weak overhead light. We went out for dinner with CUSO-VSO volunteer Mike Bobeic – from Winnipeg! We met him at one of his favorite haunts, a little family-owned restaurant that smelled of kerosene (many Ethiopian restaurants do) and had a limited menu. Meat, meat and meat. I had their only other offering scrambled eggs. We also cracked open a bottle of Tej we had picked up on the way to Maychew. Tej is a honey wine and I was worried it would be syrupy, but the flavour was more like a sweet-ish, citrus fruit juice. Delicious! Mike has been in Maychew as an IT advisor for two years and has embraced the experience whole-heartedly. He entertained us for hours with stories about the college where he works, his Ethiopians friends, his “ferengie” pals in the Peace Corp stationed there, and mountain hiking. We got up at 7:30 and met him for a hike. Winding up small dirt paths behind the town, we crossed a stream, giant cacti and women walking their donkeys and cattle home. A gorge, cut out by flooding waters during the wet season became our route as we made our way to waving fields of golden wheat and sorghum outside the community. Small-hold farmers were gathering the grain and many had their oxen out, stamping it down, separating out the chaff. Men with hand-hewn pitchforks made of tree branches lifted the wheat into the air repeatedly. Flying every which way, the grain slowly was being separated. Mike, a laughing, hearty soul, grabbed a pitchfork and joined them. Ethan got into the fray and snapped a million photos.